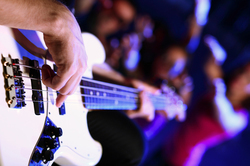 Concerts offer a thrilling experience that combines live music with visual entertainment and high energy. They let fans enjoy the talent and stage presence of their favorite band, artist, or singer in a way that cannot be matched by videos or sound recordings. For this extraordinary opportunity, treat yourself to an extravagant transportation service that can get you to and from the concert in style with maximum ease, comfort, and convenience. Katy First Class Limo offers private concert limousine service to transport you and your companions to any concert in the nearby area, for a day of luxury, excitement, and entertainment that you won't soon forget. Our limousine service brings your concert experience to the next level by providing you with a transportation option that offers exceptional comfort and luxury to passengers. Our vehicles are furnished with an abundance of extra features to keep you entertained and in high spirits for the upcoming main event. Make this occasion a celebration of music and entertainment. Katy First Class Limo ensures our passengers are treated to a perfect precursor for their concert with our limousine service. Enjoy stress-free and smooth transportation in a glamorous setting with the best amenities available to you and your guests for non-stop fun and entertainment. Katy First Class Limo delivers unsurpassed customer service and luxury to our passengers. Arrive at your concert in a top of the line limo that is sure to turn heads and draw the attention of other concert goers. Our diverse range of vehicles will ensure you find the perfect option for your needs. Select from a variety of styles for a limo that matches your passenger capacity, style, and budget. Our personalized service, stunning luxury vehicles, and professional transportation will have passengers feeling like rockstars as you make your grand entrance or exit. We offer private luxury transportation that gets passengers from their front door directly to the main entrance of their concert venue in utmost comfort and ease. Our reliable and convenient concert transportation service lets our passengers relax and enjoy the day for the best concert experience. We safely and expediently get them to and from their destination. Skip long waits, crowded buses, or overpacked parking lots that can diminish your enjoyment and leave you feeling drained. With Katy First Class Limo, the only thing you need to worry about is how to step out of the limo like a rockstar. Katy First Class Limo is the premier private transportation service for Katy, TX residents and visitors who demand top notch service, comfort, reliability, and professionalism. Our high end limousines provide passengers with luxurious and memorable transportation for all special events and occasions. Make your concert experience a thrill ride from start to finish with transportation that promises entertainment and convenience for easy and fun travel to and from the concert venue. Call us to book your concert limo today.